Bag of Crosses, 4" x 6" Pick your bag size on the right side menu . We pick the style and you save, Free shipping. We cut these small crosses from the left over wood that we cut large crosses from, this reduces our waste and our foot print that we leave on our Earth. We will pick your crosses for you from our large supply, no more then 25% of them will be the same style. They will be 1/2" and 3/4" thick. Anything under 1/2'' thick will not have a keyhole. All of our items are cut from Plum Creek MDF consisting of 80% recycled materials. 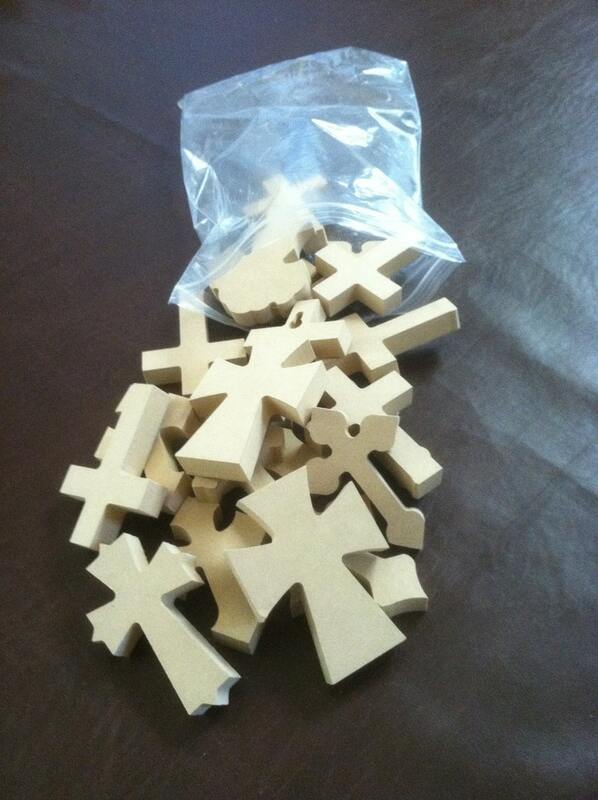 These crosses are great for church projects, home projects, home decor, gifts, Mosaic bases, etc. These crosses paint very well to suit your decorative ideas, but they do not stain well. May require light hand sanding. Please do not request a special styles because they are bag as the come off of our production line. You can find other listings where you can request a special style or styles. VBS Is coming up soon and these crosses would be a great class project. Your crosses are always perfect and I can't wait to mosaic them!! Thank you very much and I will be back soon! The crosses are beautiful. I received several different styles. They are thick, sturdy and very clean, easy to paint. Perfect, as always. Thank you! These are perfect for my project.